Right, a very different post to normal, but I've started following a sugar free diet recently and generally just not eating processed food so I wanted to start posting up some of the things I've been making, and hopefully it will give me an incentive to work a bit harder. I gave up smoking around 2 years ago and since then have gained around 2 stone in total so I'm on a mission to lose it through healthy eating and exercising, I've always eaten pretty healthily but I tend to purge on chocolate and snacks more so since I stopped smoking, almost as a reward for not smoking which has led to the increase in weight. I don't particularly calorie count but I'm aware of them and will avoid anything with huge calories in them, instead looking at healthier options. For example, I've started making a sugar free Apricot Flapjack and will have a little bit of this instead of chocolate at night when I'm relaxing. I've been reading the James Duigan Clean & Lean Series of books and this is what has spurred me onto this kind of lifestyle. It really does make you think about what you put in your body. Today's post is going to be Chicken and Vegetable soup, this works out at about 250 calories per person but because you add in the Creme Fraiche, it feels quite creamy and like you're having something a bit naughtier. It's packed full of veg and you can really experiment with this as well by adding in other veg that you prefer, I'd possibly add in Courgettes and Leek if I had, I hate mushrooms but they would probably work well in this too and if there's any veg you don't like you can take these out. I'm quite a random cook and don't measure or count things out so measurements are approximate, I will try and be a little more exact in future if you prefer it. I find the fun thing about cooking is throwing in things that don't work (Mange Tout and Baby Corn in this soup is a little random but I love the crunch it gives the soup) or adding a little extra of your favourite. Let me know if you make this and if you like these posts or if you want to hear more about anything. 1. Heat up some oil in a pan on a high heat (I use coconut oil, around a full teaspoon, but you can use whatever you like here) along with the chopped up garlic clove and salt and pepper. You want the oil to be able to coat all the veg you are about to add into the pan so start off with a little and add more if anything starts to stick. 2. Chop up the Onion, Celery, Carrot, New Potatoes and Baby Corn into small pieces, around the same size. 3. Add the Onion, Carrot & Celery into the pan, let these cook on high for a minute or two before lowering the heat to around half, cook down until the onion turns a translucent colour. 3. Whilst the Onion, Celery & Carrot are cooking, Chop up your Chicken using a separate chopping board (Raw Chicken is not good and shouldn't be mixed with uncooked food). I would also stick on a full kettle at this point and let it boil. 4. Whilst the kettle boils, keep an eye on the pan and give it a good stir. 5. Once the kettle has boiled and the onions look almost clear, add around 500ml - 650ml to the pan along with the stock cube. 7. Add the Chicken & New Potatoes and bring it to a boil before turning it down to simmer for around 45 minutes - you can change the timing here but you need to make sure the chicken is fully cooked through. 8. Add around 2-3 tablespoons of Creme Fraiche to the pot, stir quickly, it looks like it may curdle but give it a good stir and it will all melt in. 9. Around 15-20 mins before serving, add in the Baby Corn & Mange Tout, these add a bit of crunch to the soup. 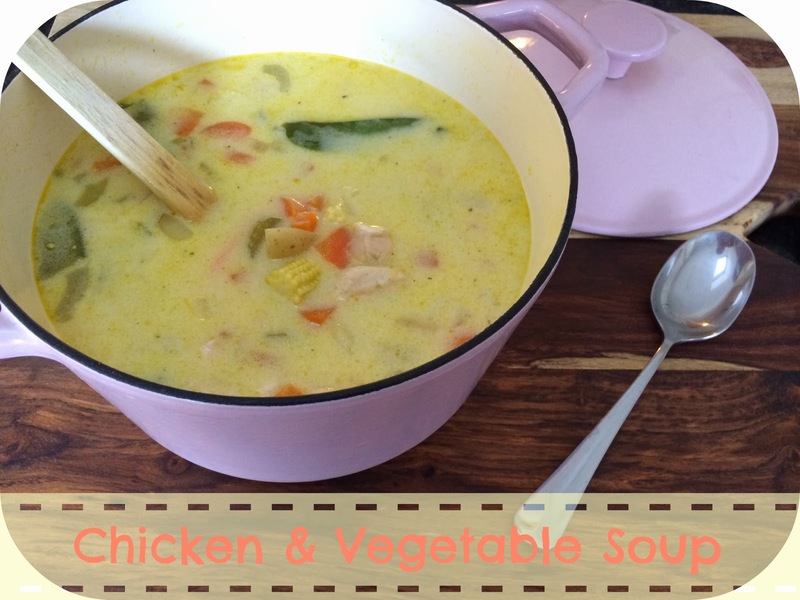 1 comment on "COOKBOOK // Chicken & Vegetable Soup // 250 - 350 Cals"
yum, I have to save this blog post. looks great!